The New Semester Opening Service is an annual event for university students of the Church of God. On March 5, 2017, over 4,000 people, including university students, pastoral staff members, and youth guidance teachers, attended the service held at the New Jerusalem Pangyo Temple in Korea. The fervor for preaching to seven billion people, which started in the beginning of last year in earnest, is growing even more in the New Year. 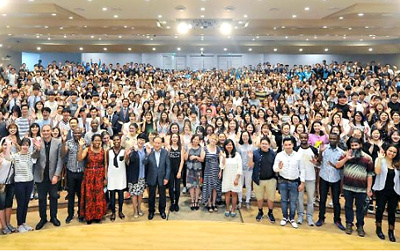 Keeping in step with it, the churches to embrace an increasing number of brothers and sisters have been built one after another, and dedication services for five churches in Yeongnam, Korea, were held for three days from January 30. On December 25, 2016, a week before the hopeful New Year’s Day, Special Lecture on Young Adults’ Vision 2016 was held at the Okcheon Go&Come Training Institute. More than 10,000 members including high school seniors, young adults who were pulling their weight in their workplaces, campuses, or the military, and the pastoral staff gathered; the institute was filled with young adults’ gospel fervor that put the cold weather to shame. On December 13, 2016, General Pastor Kim Joo-cheol made a speech to the effect that the Church of God would help the world with the United Nations, having Mother’s mind, at the UN headquarters in New York, U.S. The 2016 New Jerusalem Cultural Contents Awards Ceremony, which is an integrated awards ceremony for the Melchizedek Literary Awards, the Elohim Video Festival Awards, and the Bible Seminar Presentation Awards, was held at the New Jerusalem Bundang Temple on December 4. On November 7, 2016, the members of the 70th Overseas Visiting Group from 96 churches of 19 countries arrived at Incheon International Airport one after another. While the movement to preach to seven billion people around the world was being carried out actively, the autumn feasts were held one after another: the Feast of Trumpets, the Day of Atonement, and the Feast of Tabernacles. 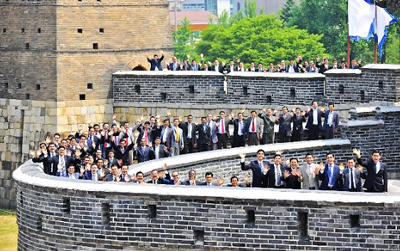 The 69th Overseas Visiting Group came from 82 churches in 17 Spanish and Portuguese speaking countries in Europe, Africa, and Central and South America the farthest continent from Korea. 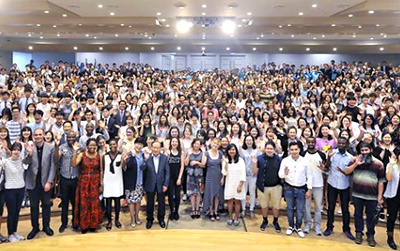 The dedication service for the Jeju Church God, located in Jejudo Island, a global resort area, was held on August 6, 2016. The Queen’s Award for Voluntary Service celebration event was held at the Okcheon Go&Come Training Institute on July 10 and 13, 2016.